The best gift to give your boy this year is The Gift of Time. This year, along with the gifts that you plan to give your boy, why not give him something that he will always remembers: The Gift of Time. At this busy time of year it is helpful to reflect on what is important to us and to our boys. It is super easy to go, go, go and get so busy that we lose sight of what matters. Boys, in particular, need to go slowly and not be all rushed and hurried. I can always tell when that stressful feeling is starting up and it is usually when we are doing too much or are rushing about. Time with our boys is fleeting. Childhood is short and flies by so quickly. Giving your boy time now to enjoy his childhood is a special gift that will continue to have an impact throughout his life. You only get one chance to let him know that being himself is the best thing he can be and finding out who he is, what he thinks, and what is important to him takes a lot of time. Play: Boys need to play. It is hardwired into their boy-ness and they have to have time to do it. I am not talking about adult organized play here. I am talking about good, old-fashioned, play. The kind where boys choose what they would enjoy doing and have enough time to do it without bells, whistles or time constraints. 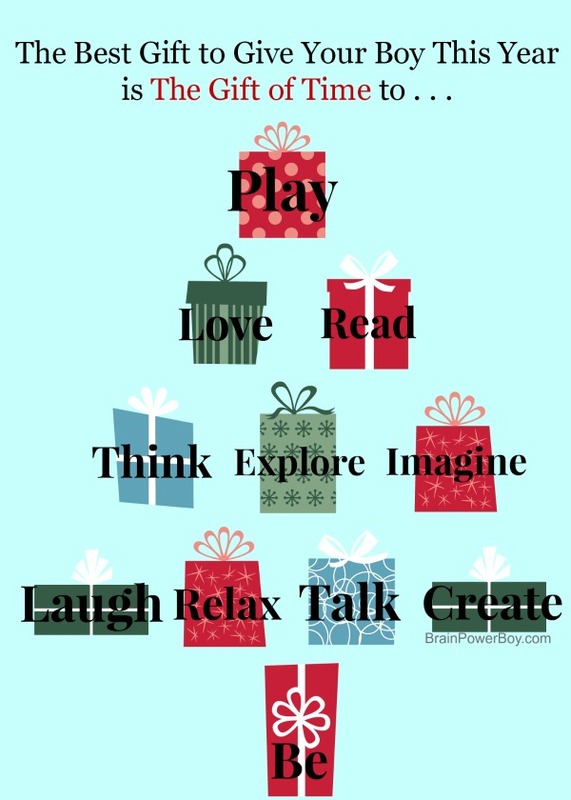 So much learning comes from play that I put this at the top of the Gift of Time tree. Love: It takes time to stop and really look someone in the eye and tell them that you love them. If you want your boys to express themselves, give them love. Touch their arm, smile at them, ask them what you can do for them. Say I love you often. Give them plenty of chances to show their love for others. Read: Have you ever gotten to a really good spot in a book and had to stop? Did you really wish you could keep reading for just a bit longer? It takes time to get into a good story. Give your boy time to read at his own pace. Give him time to lay in bed in the morning, snuggled under the covers with a great comic book. Let him stay up late reading with his flashlight shining under the covers. Ah . . . the memories of reading. Let him choose his own books. It really doesn’t matter in the least what boys read, just give them uninterrupted time to do so. If your boy says he doesn’t like to read that is fine. Perhaps it is the physical act of reading that bothers him. Read to him or try audio books or tell him stories on topics he is interested in if that works better for him. Think: The very best thinking takes place when you have time to do it! Running around all the time really doesn’t leave much time to think. By this I mean that being too busy leads to forgetfulness and confusion but doesn’t lead to deep, interesting thoughts. If a boy is a kinesthetic learner he may be on the move and doing things as he thinks, but that is different. He chooses movement and is not forced to hurry. Pondering, reflecting, speculating and thinking things over all take time. Explore: In order to explore you need time. My son and I went to the zoo one time and a large group of kids came through when we were in the reptile house. It was sad to see these eager young explorers hurried and rushed right past everything of interest because they were on a strict timetable. We were in the reptile house for over an hour and my son got to explore many types of things. It takes time to see the tiny details and find things that catch your fancy. Imagine: Boys are great pretenders. They love to make up stories and create worlds. I am always amazed by the imaginations of children. To create all of these things in ones mind takes time. You simply can’t image a delightful story out of thin air if you don’t have time to work on it. If you want your boy to create the life of his dreams you might want to give him time to imagine what that life might be like. It all starts with developing a healthy imagination and being given the time to use it. Laugh: The laughter of boys is precious. We try to laugh often. Silliness is encouraged 🙂 Laughter is proven to be very good at reducing stress and is great for a person’s health. Grab a funny book or movie or just get super goofy and hang out with your boy. You could both likely use a good laugh. Relax: Yup. Simplify your holiday and just relax. Make time for the things that matter to you and your boy. Let him make a small list of what is most important to him and only do those few things. You don’t have to go to every event known to mankind in order to have a good holiday season. In fact, I would argue that doing so will actually diminish your enjoyment. Let your boy relax and hang out. He will likely enjoy himself and remember spending time with you more than all the rushed and blurred together activities anyway. Talk: Let your boy talk to you about anything he enjoys. When he comes up to tell you something, stop what you are doing and listen. Do you know how many times boys are not listened to or half listened to every day? Yes, I know you are thinking that you can only hear so much about pirates but . . . you are giving him a lot of gifts by allowing him to talk. Take the time to listen to him because you love to hear his voice, because what he says is important to him, because it is a way to value him, because his opinion matters, because he is sharing part of himself with you, and because he is learning how to communicate. Create: You need to give your boy time to create asap if you have not been doing so. Toss a bunch of building materials together or leave out a box of art supplies. Dig out the extra LEGO bricks or whatever your son is into and give him time to create something new. Open the screen to your laptop and pop a sticky note on it saying “what will you create today?” and see what happens. If you value creativity, so will he. Maybe you could use a burst of creative energy yourself! Why not jump in and create something with him. I’m sure you will both be better for the experience. The world will come to value the creators more than those who can just follow directions given by someone else. Be: Your boy needs time to be. He needs time to find out who he is and who he wants to be. This is especially true in a world that is constantly telling boys that they have to be a certain way. Give him some space and some time to discover what he likes and what is important to him. He needs time to simply be himself. I honestly can think of no better gift to give your boy than the gift of time. Each gift of time will really make a huge difference in your boys entire life. My son helped me come up with this list. He added a few things that he felt were important and said that kids just don’t have enough time to do what they want to do. His biggest contribution was “be.” He said boys need time to “just be.” I couldn’t agree more. Give your boys time to: Play, Love, Read, Think, Explore, Imagine, Laugh, Relax, Talk, Create, and Be. Read our posts on boys’ learning, best books for boys, and LEGO by clicking on the links. Thanks for stopping by! If you enjoyed this post, please share it using the buttons below. I would love to hear about ways you give your boys the gift of time and what it means to them–please leave a comment below. With all the sales and all the “deals” and all the focus on that “perfect gift”, this is so hard to remember. But it’s also crucial! Thank you so much for sharing and reminding us of what really matters, the gift that means the world isn’t something you can just buy in a store! Thank you for the lovely comment Emma. This is one of my favorite posts so it was very nice to hear your kind words. I love your post. As a mom of 3 boys, it is a great reminder to give them what they really want, time together. They really do grow so quickly. Thank you so much Kirsten. I was really nice of you to take the time to comment. They do grow up quickly that is for sure. Seems like only yesterday my son was a toddler . . . I will pop over to visit your blog. These are such great tips! I am a mama of three boys, and I can totally relate to just letting them play. Not structured, but just letting their imaginations soar! It is amazing what these kids will come up with. One day I’m a pirate princess that they are working together to save, and the next we’re all super heroes protecting our city! Thanks for the reminder to slow down and enjoy our time with our boys while they’re little! Wonderful post and so true! I think about the precious gift of time often – sadly I often fall short with 5 kids (4 boys 1 girl) and no time. Thank you for this fantastic reminder in the spirit of the holidays. Thank you for your kind comment. We all fall short sometimes–it is hard to get everything in. I think keeping it in our minds helps. I appreciate you coming over to comment.